Best Propane Smoker Grill Combos: Choose To Cook Gas Or Wood/Charcoal! You can find multiple fuel sources, but propane-powered grills provide a few advantages. Propane is a consistent, reliable fuel source, allowing you to maintain a specific temperature without constantly monitoring the grill. Propane also helps with cleanup, as you don't have to deal with the ash created by other fuel sources. Though, many of these combo units feature a charcoal smoker, so you will still need to clean up after using the smoker. The benefit of choosing a product that combines a smoker and a grill is the convenience of being able to smoke meats and grill food at the same time, with side-by-side cooking units. You can even smoke your meats and then grill them to create an authentic smoky flavor without the use of charcoal or wood. While these appliances are not designed for portability, they feature sturdy wheels and a fuel source that doesn't require access to an electrical outlet. This makes it easier to wheel one of these appliances between your garage or shed and your backyard. If you want a new way to cook outdoors, the following options offer the best combination of value and quality. Here are the top 5 propane smoker grill combos. 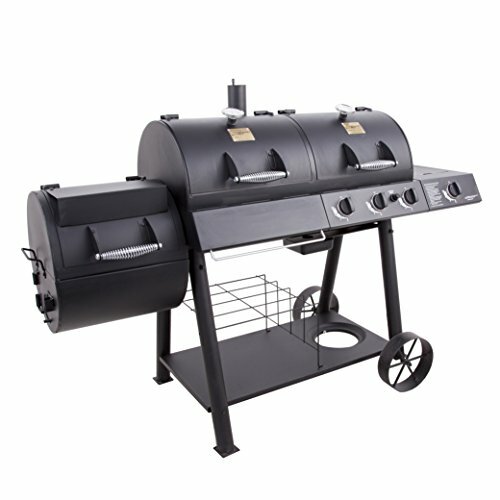 The smoker grill combo at the top of the list is three grills in one. 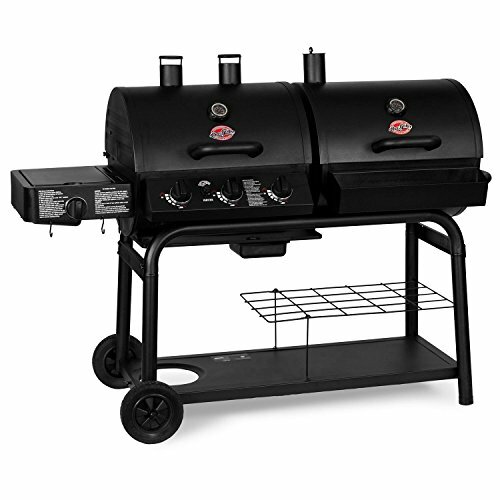 Not only is this a smoker grill combo it also has a charcoal grill and smoker. You get more cooking options without having to purchase several different appliances. This combo is built to last. Made from heavy-duty steel construction, this unit can deal with harsh weather conditions, including rain and snow. The tubular steel cart offers storage space underneath that will give you more than enough room to store fuel sources, such as charcoal or a propane tank. Speaking of having enough room, the Char-Griller Trio has a total cooking area of 1,260 square inches; with 876 of those square inches coming from the primary cooking surface. It also includes two chrome-plated warming racks and a powerful side burner. The bottom line is that this is the most versatile of the grills on this list. It is also durable and well-built. The only potential drawback is that the outer material may rust easily without a cover. It is always recommended that you cover your grill if you plan on leaving it outdoors. Numbers 1 and 2 on this list are very similar, mostly because they come from the same brand. Just because they are similar doesn’t mean they’re the same. Just like most of the smoker grill combos on this list, the Char-Griller 5050 gives you the ability to cook using three different methods: gas grilling, smoking, and charcoal grilling. While the construction looks strong and is made to last, some users have claimed that this material tends to rust after being used frequently and being stored in places with severe weather. Again, keeping the grill out of the rain or covering with a suitable cover should help prevent rusting. You’ll notice that the height of the grate can be adjusted for this grill, so you can use direct or indirect cooking methods to get a perfectly cooked piece of meat. This grill can emit almost 41,000 BTU’s between the three units, which is an overwhelming amount of power. The side burner alone can produce 12,000 BTU’s. Oh, and let’s not forget the cleaning part. The easy-dump ash pan is just that: easy. No need to scrub the lid, no need to carry a heavy part of the grill filled with ash. It should be mentioned that like most grills/smoker combos, this unit will require assembly. Some users have had trouble assembling this appliance. If you tend to have trouble putting things together, make sure that you pay close attention to the assembly instructions. The 8500 LP smoker grill combo from the Smoke Hollow brand will easily become your favorite outdoor cooking appliance. It includes a propane-powered smoker and grill, along with a charcoal grill. You also get plenty of heat from the propane burners. 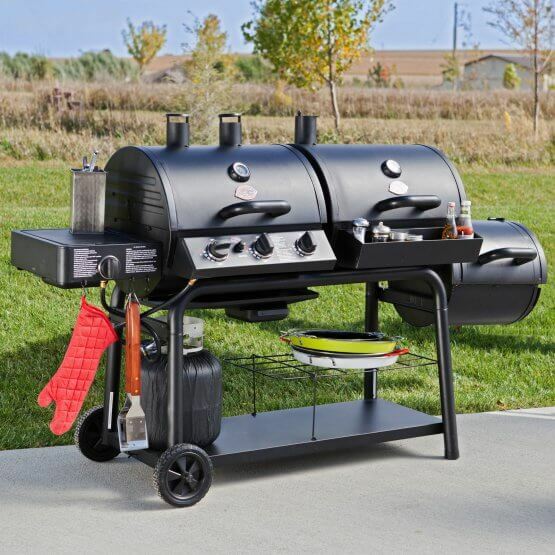 The gas side of this smoker grill combo contains three stainless steel burners that produce about 10,000 BTU’s total. The sear burner can also produce about 12,000 BTU’s, so there is always a high-powered heat source available for you. If you include the sear box right above the propane hose, this smoker grill combo technically has four separate ways to cook your meats. Those who truly enjoy variety will be more than satisfied with this product. 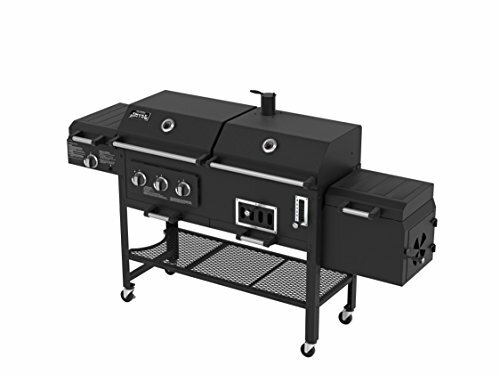 In addition to the gas grill and the smoker, the Smoke Hollow 8500 LP also has a charcoal grill ready for you just in case you’re in the mood for a smoky taste but don’t want to wait for the smoker to finish cooking the meat. All the cooking grates used in the 8500 LP smoker grill combo are made of a porcelain coated cast iron. This finish is very durable, so you won’t need to worry about it deteriorating over time. You can also wipe down the grates with ease and remove the hardened food particles and residue that accumulate from grilling. Grilling outdoors using the same cooking method can get monotonous after a while. The Char-Broil Oklahoma Joe’s propane/charcoal smoker grill combo has plenty of choices when it comes to grilling food outdoors. Between all the cooking platforms, you get 1,060-square inches of space; 750-square inches are located on the main cooking surface. There is also a large amount of space underneath for storage. A propane tank of any size will be able to fit easily, as well as a charcoal bag or other grilling accessories like condiments or cooking tools. Each burner is capable of releasing 12,000 BTU’s on its own, totaling at 36,000 BTU’s. The side burner accommodates the charcoal chimney starter and can also discharge about 12,000 BTU’s. Transporting this grill is easy. It has two wheels to help you roll it wherever you please. The propane smoker grill combo is roughly 200-pounds, which makes it difficult to pick up, but the rolling wheels will help you get the grill from your shed to the backyard. If you prefer portability and need something that you can fit in your vehicle, there are portable electric smokers. They won't offer the benefit of including a grill, but they can be transported in smaller cars. No matter what you’re in the mood for, the Oklahoma Joe’s propane smoker grill combo will offer you variety. Purchasing this grill is like buying four grills that are combined into one machine. 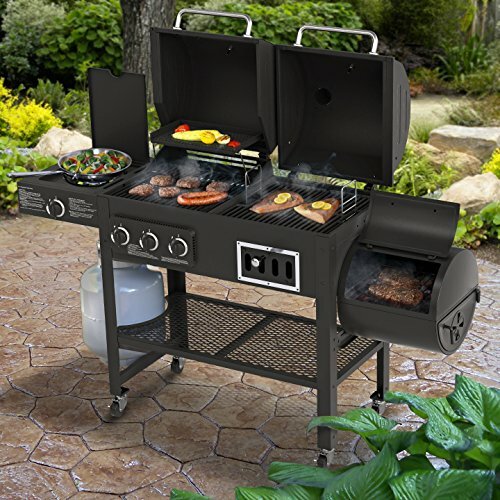 Another 4-in-1 grill from Smoke Hollow, the 3500 is a propane gas and charcoal combo grill with a smoker and a side burner. This consists of 3 stainless steel tube burners that release 10,000 BTU’s, along with a side burner that ejects almost the same amount at 9,300 BTU’s! With four separate ways to cook, you won’t have to take up a tremendous amount of space in your backyard with 3 or 4 different grills. Now you can conveniently have everything all in one spot. What stands out the most about the Smoker Hollow 3500 is the reasonable price range in which it’s offered. In a world of combo grills, higher prices are the norm, but this option is relatively affordable. Just because the price is lower than average doesn’t mean that it’s made with cheap material either. The cooking grids on the gas and charcoal area are made of cast iron, so they will hold up to regular use and clean easy. Nothing is worse than scrubbing the cooking grids for hours when it only took 30 minutes to cook your food. How do you find the best smoker grill combo? There isn’t just one factor to consider, but based on the average price of one of these units, it’s better to be thorough in the buying process. Here are some of the main factors to pay attention to. First, you may want a grill that has a lot of space underneath. The extra space can be used for storing fuel, especially if you choose a grill that uses both propane and charcoal. While you could store the fuel to the side, having a spot underneath the grill keeps it within easy reach. You should also consider how many people you plan on cooking for. If you regularly cook for large gatherings, you will want plenty of cooking space. Paying attention to the square-inch surface of the grill and smoker will help you select the right model. Along with the number of people that you may cook for, you should think of the type of cooking. For example, the Smoke Hollow 3500 is a 3-in-1 appliance that provides the most convenience. If you don't need the combination of three appliances, then you can save money by simply purchasing one of the other 2-in-1 grill smoker combos. The next concern is the price. Before you start shopping, you should have a general idea of how much money you want to spend. The more affordable options can cost several hundred dollars. If this is out of your price range, examine the best pellet smoker grill combos. Since the pellet combos don't require two separate cooking areas, they tend to cost less but lack the convenience of side-by-side grills and smokers. Choosing the cheapest option will save you money, but the reduction in cost also often leads to a reduction in durability. Typically, you pay for quality, so if you want a sturdy grill that will offer years of regular use, it can be worth the cost to spend a little more. It should also be mentioned that the smokers combined with grills are horizontal smokers. This is due to the placement of the side-by-side appliances. If you already have a grill, then consider looking at the top 5 best vertical propane smokers. In conclusion, there is a time and place for everything. Whether you’re a fan of propane gas, charcoal, or flat out smoking, these grills combinations have something for everyone. Smoker grill combos are perfect for occasions when you have a lot of time, as well as when you’re in a hurry. The smoker typically cooks food slowly, while the grill can properly cook a piece of meat within a short window of time. Other than this convenience, what else should you know about propane smoker grill combos? The first benefit is related to the fuel source. Propane offers instant, consistent heat. It doesn't take very long for a gas grill to heat up. With a charcoal, wood, or pellet grill, the process takes a little longer. With propane, you can simply turn a dial or push a button to start heating your grill. You also don't have to worry about cleaning ash from charcoal or wood from a propane grill. Though, the smokers that are attached to these combo units are typically powered by charcoal. Overall, the steps needed to clean one of these units is easier than with a charcoal or wood-powered grill. With a smoker grill combo, you can smoke and grill at the same time. While you could accomplish this by using a separate grill and smoker, it is more convenient to have both appliances in one unit. 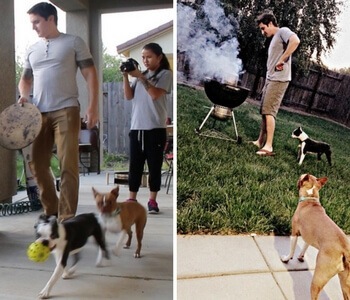 This is especially true if you plan on cooking outside your backyard. For example, if you intend to cook at a park or campground, these combo units will take up less space than two separate appliances. Since smoking meats takes a considerable amount of time, having a grill handy is useful. While you're waiting for your meats to cook in the smoker, you can cook the first course of the meal on the grill. Through these combinations of benefits, having a propane smoker grill combo can help make your outdoor cooking a more enjoyable experience. If this sounds like a promising idea, then you should consider getting one of the appliances listed above. You are here: Home / Outdoor Cooking / Best Propane Smoker Grill Combos: Choose To Cook Gas Or Wood/Charcoal!